Neil Gaiman has won the appeal of his case against Todd McFarlane, giving him co-ownership of Angela, Medieval Spawn, and Cogliostro, the characters he spawned in his script for Spawn #9. The gist of the decision was that, in absence of a written contract assigning copyright of the script to McFarlane, Gaiman has co-ownership of whatever characters he created in it. (Because McFarlane illustrated the stories, contributing his own ideas to the characters as he drew them, he has co-ownership of them.) It has almost no bearing on the prospects of seeing Miracleman back in print soon… but that’s because it wasn’t really an obstacle in the first place. One of the tricky aspects of the case was the nature of Gaiman’s and McFarlane’s agreement. It had been a handshake deal, with McFarlane merely promising to treat Gaiman “better than the big boys” (Marvel and DC) would treat him. Gaiman finally ended up asking that McFarlane just treat him the same as the big boys (specifically DC) do. The court considered the possibility that this meant just a Work For Hire agreement, like Marvel and DC usually offer writers. But because Gaiman wasn’t treated as an employee (with a salary, benefits, etc.) and because there was no signed piece of paper saying that it was Work For Hire (like Marvel and DC have writers sign), it was not WFH. That means Gaiman is co-creator, and co-owner of everything new he added to the Spawn story in issue #9. McFarlane had conceded that Gaiman co-created (and co-owned) Angela. He disputed Gaiman’s claim to Medieval Spawn and Cogliostro. One of the issues of the case was whether the statute of limitations had run out on Gaiman’s suit. Under federal copyright law, the injured party has 3 years to sue once he discovers that someone is claiming to own something he created. 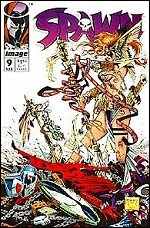 McFarlane tried to argue that the copyright notices he’d put in Spawn #9 (in 1992) and in the later reprints of that issue and Gaiman’s Angela mini-series (in 1997), had notified Gaimain of his claim. But the court ruled that these weren’t sufficient notice, because the first copyright statement was ambiguous and the author wasn’t expected to read the copyright statements in the reprints. There was also the example of McFarlane’s copyright registration, but the court said Gaiman wasn’t expected to watch the Library of Congress records, either. Furthermore, McFarlane had referred to Gaiman as “co-creator” of these characters and paid him royalties, as he’d be entitled to as co-owner. The first unamiguous claim of sole ownership didn’t come until February 1999, when McFarlane sent Gaiman a letter declaring (emphasis added) “all rights to Medieval Spawn and Cogliostro shall continue to be owned by Todd McFarlane Productions”. Gaiman filed his suit one month before the 3-year limit. The statute of limitations question turned out to be a red herring, because Gaiman wasn’t claiming that McFarlane had violated his copyright. As co-owner, McFarlane had every right to publish Angie, Med, and Cog. The issue was simply whether Gaiman had been given his fair share of the profit. McFarlane also had a backup argument for why Gaiman couldn’t be co-owner of the two disputed characters: they weren’t copyrightable. For example, he claimed that Count Nicholas Cogliostro was just a “stock” character, and you can’t copyright a character which is nothing more than a standard literary cliché. But the court ruled that Cogliostro was distinctive enough to be copyrighted, and that each of the people who contributed to building that distinctive character (Gaiman’s description and name, McFarlane’s somewhat differing illustration) was a co-owner. The question of Medieval Spawn’s copyrightability was settled by declaring that he was sufficiently different enough from the Al Simmons Spawn character to be distinguishable from the original (but still a derivative work that would automatically give Spawn’s original creator certain rights to him). Incidentally, there’s nothing fishy about McFarlane having two mutually inconsistent arguments for why Gaimain’s suit is invalid. For one thing, it’s common practise in legal matters to have a Plan B in case Plan A doesn’t work. In fact, if Plan A failed, and Plan B - which the lawyer didn’t use because he didn’t really agree with it - would have worked, the client could sue the lawyer for malpractise. In an adversarial legal system, it’s the lawyer’s job to win, not to be right. Second, it’s a bit like saying that you didn’t shoot someone, and you can prove it because A) you were out of town when it happened, and B) you don’t know how to fire a gun. Whichever convinces the jury. Lawyers and judges tend to get a bad rap as obfuscatory blowhards. But if you read the actual decision written by the court, you’ll find a rather personable, well-reasoned, and in places just a wee bit sarcastic description of what the real issues involved were and how they applied to this situation. Neil Gaimain has commented about the verdict on his blog. This item was posted on Wednesday, February 25th, 2004 at 5:11 pm	and is filed under Contracts, Copyrights. You can follow any responses to this entry through the RSS 2.0 feed. You can leave a response, or trackback from your own site.